Proportionate response? Israel is considering approving several "sensitive" housing plans in response to UNESCO's Monday vote admitting the Palestinian Authority as a full member in the organization. The eight-minister forum will convene on Tuesday to discuss Israel's reaction to the UNESCO vote and its ramifications. The controversial vote prompted Foreign Minister Avigdor Lieberman to announce that Israel would "review its relations" with the United Nations Educational Scientific and Cultural Organization; and the United States announced it was suspending the financial support given to the agency. The US is responsible for 22% of UNESCO's budget – roughly $60 million. "What happened in UNESCO is no simple matter and it has to be taken seriously," a diplomatic source told Ynet. "Israel may choose to mount a unilateral response of its own to this move." "The implications of the change to the PA's status have to be explored, since it backs their unilateral move in the UN." Top Jerusalem sources told Ynet that, "There may be a specific response to the Palestinian gambit via a unilateral move in places which Israel does not view as problematic – but might meet international objection." The source hinted that Israel was now mulling the possibility of green-lighting construction projects in places largely viewed by the global community as Palestinian territories. A top Israeli official said that "no final decision has been made at this time… Since the incident during US Vice President Biden's visit the prime minister goes to great lengths not to surprise the Americans. This could take several days to happen. Sources privy to the inner workings of the Israeli-Palestinian peace process were pessimistic Monday as to the chances of the parties resuming negotiations in the foreseeable future. The Quartet, they ventured, has little chance of reigniting the peace talks: "The PA may be divided over the UN bid, but they are also under considerable pressure to pursue it further, since it projects a sense of success. "They know the US will veto the bid in the Security Council, but they feel they can win vast support at the General Assembly. A vote there will make it abundantly clear who supports a Palestinian state and who opposes it," a Jerusalem source told Ynet. 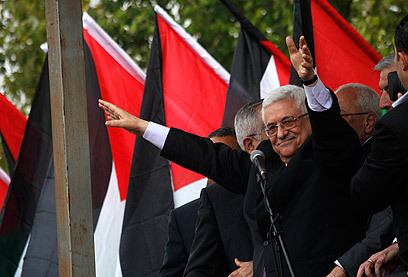 Israel believes that Palestinian President Mahmoud Abbas is encouraged by the diplomatic dynamic. "There is mounting pressure (within the PA) to see the bid through," a top diplomatic source said. "This poses a danger for Israel because it may change the internal dynamics and discourse both in Israel and the PA and sway the focus away from a two-state solution, to a binational state solution." See all talkbacks "Israel mulling response to PA's UNESCO gambit"